This document represents a common understanding of Town and University officials regarding what will be expected and accepted as fulfilling the requirements of section 16.3.1 of the Development Ordinance for information on Transportation Management to be submitted as part of a Main Campus Development Plan. 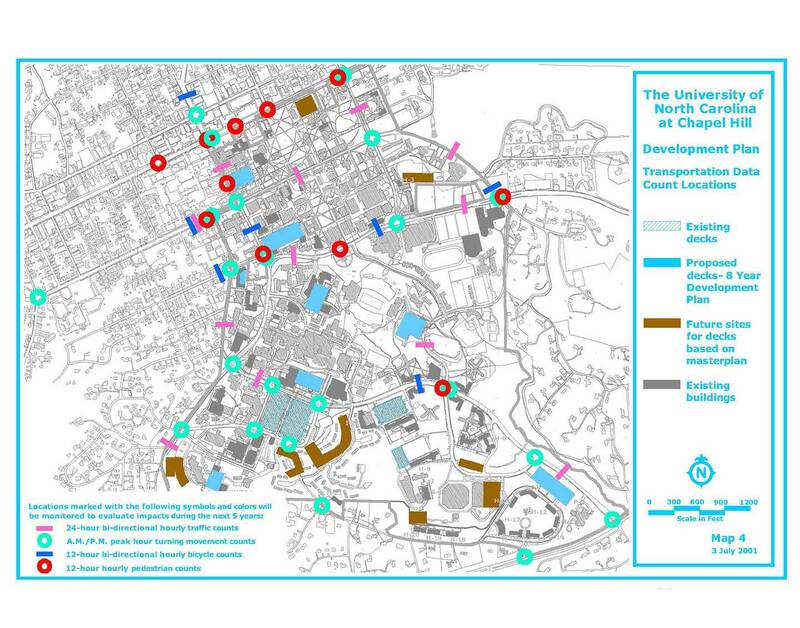 A Transportation Impact Analysis for a Development Plan shall be submitted to the Town of Chapel Hill by the University of North Carolina at Chapel Hill in accordance with the requirements of the Town’s Office/lnstitutional-4 (0I-4) Zoning District regulations. The purpose of the Transportation Impact Analysis is to provide updated data that allows identification of transportation impacts and mitigation measures associated with a Development Plan, along with an implementation and monitoring plan for identified mitigation measures. The analysis would also identify the extent of the University’s contribution to and responsibility for mitigating transportation impacts. Elements to be addressed, as part of the analysis shall include motorized traffic, transit, parking, bicycle and pedestrian traffic, and associated air quality issues. The Initial Transportation Impact Analysis shall be submitted with the Development Plan. An Updated Transportation Impact Analysis shall be submitted in December 2001. Subsequent updates shall be submitted in December 2003 and biennially thereafter (referred to as Biennial Updates) until construction of the buildings included in the Development Plan is substantially complete or until a new Development Plan is approved. No new data shall be collected for the Initial Transportation Impact Analysis that accompanies the Development Plan. The Initial Transportation Impact Analysis shall rely on existing data only. Where reasonably current data are available, the University shall use said data to make current estimates of the required data. Collection of new data as described under Methodology shall be undertaken for the December 2001 submission of the Updated Transportation Impact Analysis and subsequent Biennial Updates. This data shall be collected in September/October of the applicable year. The Transportation Management Plan shall be undertaken every three years because of the length of time required to construct and occupy projects within the Development Plan. The first Transportation Management Plan shall be submitted in December 2001. Subsequent updates shall be submitted in December 2004 and every three years thereafter until construction of the buildings included in the Development Plan is substantially complete or until a new Development Plan is approved. Depending on the results of the data and the associated analyses, the University and Town may agree that some data collection and associated analyses may be eliminated or added for Biennial Updates. The following methodology and procedures shall be applied in developing the Initial Transportation Impact Analysis for each submitted Development Plan, and they shall take precedence over the Proposed Guidelines for Traffic Impact Analysis, Town of Chapel Hill, North Carolina (May 2001). A map showing the location of proposed projects included in the Development Plan shall be prepared. The site of each proposed project shall be numbered so that it can be associated with its specifications that shall be described in a separate table (see Item A2). A project number that corresponds to the map described in Item A 1. The date construction is anticipated to commence. If a building, the date the building is anticipated to be occupied. Whether the building is a new facility, adds additional space to an existing building, is a renovation, or is a replacement of an existing facility. Gross square feet (GSF) of the proposed building. Brief description of the general use of the building(s) (e.g., office, research facility, classroom, housing, etc.). Estimated number of employees planned to occupy the building. If applicable, estimated number or other occupants, e.g., students, theater patrons, patients. A description of any existing buildings or other activities on the proposed project site so that net transportation impacts can be ascertained. The origin of the employees and other occupants of the proposed building, specifically whether they are currently located in other buildings within the Development Plan area or are new to the Development Plan area. A general conclusion on whether the proposed project for that site has the potential to increase transportation demands in the Development Plan area. Gross square feet of the proposed building. Brief description of the general use of the building, e.g., office, research facility, classroom, housing. If applicable, estimated number or other occupants (e.g., students, theater patrons, patients). The appropriate code for the type of building use, as defined in the most current edition of the Institute of Transportation Engineers (ITE) Trip Generation Manual. The AM. and P.M. peak hour and daily (24-hour weekday) traffic generation estimates from the Trip Generation Manual, or other available sources if the University can provide a more accurate estimate of traffic generation. Where the necessary data is available, the trip generation shall be calculated in two ways: based on GSF and based on number of employees. The purpose of these estimates is to provide baseline traffic data for the hypothetical situation where no traffic mitigation strategies are implemented. Corresponding estimates of the generated person trips. This information shall be shown on a map. The impact of each of the proposed trip reduction measures shall be described and evaluated at the time of the Development Plan submission. The descriptions shall include actions taken to date and planned programs, actions, and facilities. Growth rates to account for increases in background traffic (unrelated to projects in the Development Plan area) between the year for which the counts described in Items A4 and A5 apply and the year the final project in the Development Plan is completed shall be applied to those counts to obtain future “no-build” traffic estimates. The University and Town will agree on appropriate growth rates for each location. The no-build traffic counts (peak hour and 24-hour) shall be shown on a map. A map and table showing proposed parking changes in the Development Plan area that accompany and are part of the Development Plan shall be prepared. The table shall include a tabulation of parking losses and increases by location, and the existing and proposed allocation of that parking by type of user (student, employee, visitor). A summary of total parking in the Development Plan area by location, allocation (type of permits), use by patients/visitors, and peak occupancy shall be prepared to the degree existing data is available. Directional hourly entering/exiting counts from existing parking decks shall be estimated from available data. The amount of traffic generated in the AM. and P.M. peak hours and on a typical day shall be calculated for each parking facility that is proposed for permanent addition, expansion, or elimination. The calculations shall be based on traffic generation rates for the different types of parking facilities (employee, student, and visitor) obtained in Item A10. This traffic shall be subtracted or added as appropriate to the Development Plan area road system by applying a traffic distribution pattern that will be determined by the University and agreed to by the Town. This data shall be shown on a map. The no-build traffic counts estimated in Item AS shall be modified based on the changes determined in Item A 11 to obtain “build” traffic (i.e., traffic with background growth and projects in the Development Plan). This data shall be shown on a map. To the degree available, transit data shall be summarized. This shall include individual route transit stop boardings to be provided by Chapel Hill Transit. The University shall provide an inventory of all existing and future proposed bus stop locations and amenities in the Development Plan area. The counts collected in Items A 13, A 14, and A 15 shall be tabulated. Level of service (LOS) shall be calculated for existing, no-build, and build conditions at the intersections identified in Item A5 using the latest version of the Highway Capacity Manual Software, Synchro, or other similar software. These results shall be shown in a table. The Development Plan adds 10 percent or more to the no-build traffic on any approach leg of the intersection during the A.M. or P.M. peak period where the intersection is operating at LOS C or better. The Development Plan adds 5 percent or more to the no-build traffic on any approach leg of the intersection during the A.M. or P.M. peak period where the intersection is operating at LOS D or worse. Such intersections shall be identified by applying the traffic estimates from the traffic distribution task described in Item A 11 to traffic count data to be provided by the Town for intersections that the University and Town agree may potentially meet the above criteria. If an intersection is identified as meeting the criteria, LOS analysis shall be undertaken for existing, no-build, and build conditions using available count data. An estimate of air pollution impacts shall be determined based on the calculated number of vehicular trips associated with the Development Plan with and without trip reduction strategies. Calculations shall include the total reduction in vehicle miles of travel (using the average vehicular trip length as ascertained from the Triangle Regional Model or other reliable sources) and generally accepted rates of emissions per vehicle mile of travel, to be agreed on by the Town and the University. The findings, methodology, supporting data and calculations (including electronic files) shall be documented in a report to be referred to as the Initial Transportation Impact Analysis. The following methodology and procedures shall be applied in developing the Updated Transportation Impact Analysis and Biennial Updates for each submitted Development Plan, and they shall take precedence over the Proposed Guidelines for Traffic Impact Analysis, Town of Chapel Hill, North Carolina (May 2001). If applicable, the map showing the location of proposed projects described in Item A 1 shall be updated. If applicable, the table described in Item A2 shall be updated. If applicable, the table described in Item A3 shall be updated. All counts shall be undertaken on a Tuesday, Wednesday or Thursday when school is in session. The subsequent count undertaken for each location for the biennial updates shall be undertaken on the same weekday as the initial count. This information shall be shown on a map. The count data collected in Items B4 and B5 shall be tabulated along with corresponding data collected in previous years and the percent growth (or decline) calculated and shown. The no-build traffic data (peak hour and 24-hour) shall be projected by applying appropriate growth rates to be agreed on by the University and Town (as described in Item AS). If applicable, the map and table showing proposed parking changes in the Development Plan area as described in Item A9 shall be updated. The summary of total parking in the Development Plan area by location, allocation (type of permits), use by patients/visitors, and peak occupancy, as described in Item A 10, shall be updated. Sample directional entering/exiting counts from each parking deck shall be undertaken on an hourly basis for a 24-hour period on a Tuesday, Wednesday or Thursday. The amount of traffic generated in the AM. and P.M. peak hours and on a typical day shall be calculated for each parking facility that is proposed for permanent addition, expansion, or elimination. The calculations shall be based on traffic generation rates for the different types of parking facilities (employee, student, and visitor) obtained in Item B9. This traffic shall be subtracted or added as appropriate to the Development Plan area road system by applying a traffic distribution pattern that will determined by the University and agreed to by the Town. This data shall be shown on a map. The no-build traffic projected in Item B7 shall be modified based on the changes determined in Item B10 to obtain updated build traffic. This data shall be shown on a map. Transit data shall be collected and summarized. This will include individual route transit stop boardings to be provided by Chapel Hill Transit. The University shall provide an inventory of all existing and future proposed bus stop locations and amenities in the Development Plan area. 12-hour (7:00 AM. to 7:00 P.M.) hourly pedestrian counts shall be undertaken at the street crossing locations specified below. The counts collected in Items B12, B13, and B14 shall be tabulated along with corresponding data collected in previous years and the percent growth (or decline) calculated and shown. A survey of a representative sample of University and Hospitals employees and students shall be undertaken to determine mode of travel and other travel characteristics. The survey methodology, data collected and summary of findings shall be similar to The University Commuting Study undertaken by the University in April 1997. Biennial updates shall include a summary of place of residence by zip code and total employment at all University and Hospital facilities (Main Campus and other locations). The traffic generation estimates developed in Item B3 shall be adjusted to account for proposed trip reduction strategies, with the results shown in the table. Level of service (LOS) shall be calculated for existing, no-build, and build conditions at the intersections identified in Item B5 using the latest version of the Highway Capacity Manual Software, Synchro, or other similar software. These results shall be shown in a table. As part of the LOS analysis, existing signal timing plans shall be modified if needed. Additionally, progression analyses shall be conducted using the Synchro software on the major roadways associated with intersections listed in Item B5. The detailed time-space diagrams produced by the Synchro software shall be part of this report. The Development Plan adds 10 percent or more to the no-build traffic on any approach leg of the intersection during the AM. or P.M. peak period where the intersection is operating at LOS C or better. The Development Plan adds 5 percent or more to the no-build traffic on any approach leg of the intersection during the AM. or P.M. peak period where the intersection is operating at LOS D or worse.